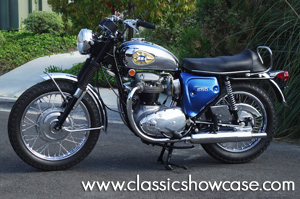 This is a highly collectible, classic British twin motorcycle that has benefited from a comprehensive, ground up restoration, and has been stored as part of a collection. During the professional restoration process, the instruments were rebuilt and the Smiths speedometer/odometer was reset, and the frame received a beautiful powder coating. Mechanically, the cylinder was bored .020 over, with the crank being turned .010 under on the rods and right side main, with no after market sheet metal used in the restoration. In addition, the bike has received new bearings throughout, a new clutch, rebuilt front forks, and a professional valve job. This BSA Lightning is ready to be shown or ridden, and will make an excellent compliment to any collection! The 1970 BSA Lightning represented one of the last efforts of this proud British motorcycle maker to stave off the onslaught from Japanese-brand competitors Due to its proven track record, the 650-cc vertical twin used in the Lightning was also the power-plant of choice for several other BSA models. But because funds were beginning to dry up, the company made few product changes in 1970. Among those few changes were better brakes for the Lightning, which now sported an eight-inch drum with twin leading shoes up front, and a seven-inch drum in back. Also, a passenger grab rail was added that surrounded the rear section of the seat. The 1970 BSA Lightning was the last of the BSA’s twins to have an oil tank beneath the seat.